The Tiempo Legend VII blends the old school styles with the new school technology to create one beast of a Frankenstein cleat. 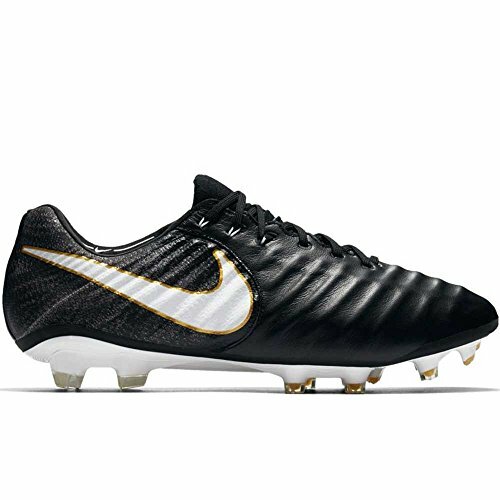 The Tiempo Legend VII still boasts a wildly soft premium kangaroo leather upper that everyone who has ever had the pleasure of donning the Legends of the past has come to know and love. That upper provides a wonderful, soft touch for excellent control in traffic while also ensuring a comfortable fit. The new editions to this pair of Legends are the Flyknit constructed heel and tongue, which adds breathability and stretch to the already comfortable cleats, and the Flywire cables that are interlocked with the laces and work in conjunction with the NIKEGRIP technology inside the cleat to help keep your foot in place inside the cleat. Ultralight, super-strong cables wrap the midfoot and integrate with the laces to provide lockdown as you cut and sprint. Firm-ground (FG) cleats for use on slightly wet short-grass fields.